Prime Minister Stephen Harper and the other G8 leaders reach a seven-point plan aimed at stopping the conflict in Syria, wrapping up a two-day summit in Northern Ireland following talks on trade, tax evasion, poverty and terrorism. The G8 leaders have wrapped up their summit in Northern Ireland with promises to share information to fight "the scourge" of tax evasion, to be more transparent, and to stop the bloodshed in Syria. British Prime Minister David Cameron, host of the summit, told a closing news conference Tuesday that the Syrian conflict was the most difficult issue dealt with at the two-day meeting. He said it was no secret that there were "very different views around the G8 table," but the leaders overcame "fundamental differences" to agree on a way forward through "frank discussion." The G8 declaration did not mention Syrian President Bashar al-Assad by name or call for him to step down but Cameron said it would be "unthinkable" for him to be part of any future government in the war-torn country where an estimated 93,000 people have died. "He has blood on his hands; he's used chemical weapons," said Cameron. But the declaration did not include such blunt language. Instead, it condemned the use of chemical weapons generally and said the UN should be allowed to do an objective investigation and that whoever uses them should be held accountable. The declaration says the G8 countries are committed to working together "to stop the bloodshed and loss of life" and to finding a political solution to the crisis. They endorsed the idea of the peace conference to be held in Geneva "as soon as possible" and paving the way for a "transitional governing body" to take power in Syria. Prime Minister Stephen Harper said the fact that Russian President Vladimir Putin, Syria's key ally, agreed to the declaration and its mention of a transitional government marks a shift in his position. "I think this was a very significant move on the part of Mr. Putin and the Russians," Harper said at his closing news conference. "I think we're all on the same page now." Putin has rejected the reports of Assad's regime using chemical weapons and said at his closing news conference that there is no proof that the Syrian government used the weapons. Harper said ahead of the summit that Putin was supporting Assad's "thugs" and that he didn't expect the summit to produce a common position on Syria among the leaders. He said the G8 was really "the G7 plus one." But on Tuesday Harper changed his tune and said "we don't have, as I said, G7 plus one, we have a genuine G8 statement." Increase commitment to humanitarian aid. "Maximize the diplomatic pressure" to bring all sides to the table as soon as possible. Back a "transitional governing body" for Syria. "Learn the lessons of Iraq" and maintain Syria's public institutions. 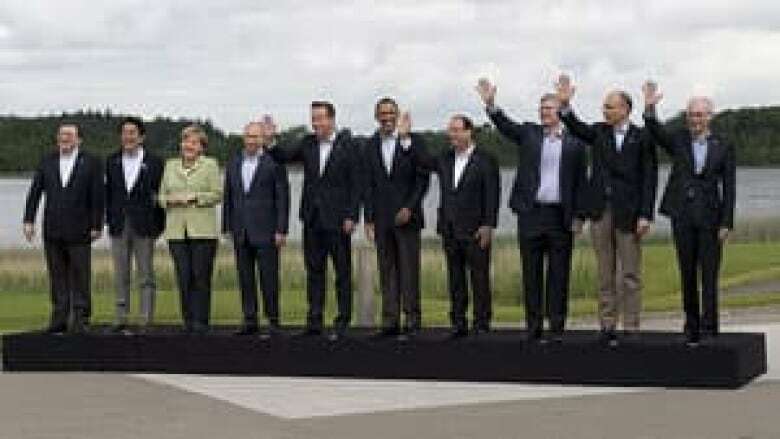 Work together to "rid Syria of terrorists and extremists" — a new commitment by the G8, Cameron said. Condemn the use of chemical weapons "by anyone" in Syria, and allow for a UN probe, also new Cameron said. Support a new non-sectarian government in Syria. The British prime minister said it wasn't easy for the leaders to reach an agreement. "Every leader around that table knows that words alone won't stop the suffering, the task now is to turn that into real action," he said. While the conflict in Syria dominated the meeting, tax evasion and transparency were officially the themes of this G8 summit, and the leaders agreed to a series of commitments such as sharing information with each other and changing rules that let companies shift their profits across borders to avoid paying tax. Companies should know who really owns them and tax collectors and law enforcement should be able to get that information easily, the G8 leaders said. They agreed to ask the Organization for Economic Co-operation to develop a new tool that would expose discrepancies between where multinational companies earn their profits and where they pay their taxes. The G8 also agreed to the proposal that oil, gas and mining companies should report what they pay to governments and governments should publish what they get, "so that natural resources are a blessing and not a curse," Cameron said. The European Union and the United States announced at the summit that they would enter negotiations for a trade deal, which has raised questions about Canada's negotiations with the EU that have been dragging on for years. Cameron said he doesn't think the EU-US deal will displace the EU-Canada deal, but that it's in everyone's interest to finish it before other talks kick off. He said the two sides are very close to sealing the deal and that the G8 meeting added some pressure to resolving outstanding issues. "One more go and we'll be there," he said. Harper said that the EU-U.S. negotiations are a good thing for the global trading system and that they don't change much for Canada. "We should stay at the table until we get a deal that is in the best interests of Canadians. We're not quite there but we continue to make progress," said Harper. Earlier, Harper and U.S. President Barack Obama held an informal meeting as the G8 summit neared its close. Harper told reporters they discussed "a range of Canada-US issues that you would expect, obviously the Keystone pipeline." He said they also talked about border cooperation measures and their perspectives on big international issues. Before the G8, Harper said he understood why Obama is supplying small arms to the Syrian opposition, after the U.S. recently said it had proof that Assad has used chemical weapons against rebels. Harper has maintained that Canada's support in Syria will remain humanitarian in nature. Harper and Obama met the morning after a private dinner at the lakeside Lough Erne resort for the leaders of eight of the world's leading industrialized countries. Obama held what was described as a tense meeting with Putin on Monday, and the two later said they would both push for peace in war-torn Syria. In line with the G8 leaders' pledges to fight tax evasion, Harper's office issued a statement outlining the steps Canada is taking on tax evasion, money laundering and other financial crimes. Some of the measures had previously been announced. The government has formed a working group on the risks of terrorist financing and money laundering, and will hold stakeholder consultations on corporate transparency. Changes to the beneficial ownership rules are taking effect in 2014, as are changes to customer due diligence rules that include more monitoring of clients, enhanced record keeping and new measures to deal with high-risk customers. More measures could be introduced following the consultations. Harper's statement commended Cameron for putting the tax evasion and transparency issues on the agenda for this G8 meeting. "I applaud the UK Presidency's focus on tax, trade and transparency – priorities that find great reciprocity with our government's commitment to Canadians," said Harper. "Canada, like the UK, believes that these priorities are critical to growth, prosperity and economic development worldwide, and we are pleased to do our part." Harper also announced that Canada formally adopted an Open Data Charter with the other G8 leaders. It commits Canada to proactively release more information through an online registry of government data holdings, and the charter commits the countries to make their data comparable. The government also announced Tuesday the launch of a new portal called data.gc.ca on its Open Data Portal that contains datasets from 20 government departments and agencies. Another significant agreement reached at the G8 was a declaration to stop paying ransom to terrorists for kidnap victims. Cameron said tens of millions of dollars have been paid to al-Qaeda and its allies and these payments have to stop.